Excellent Quality Imprints are available from One Spot Color, to 4 Color Process. 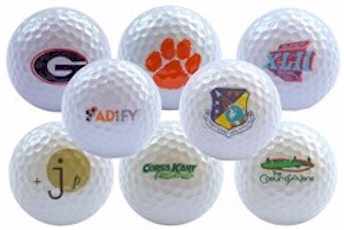 These quality Golf Balls are not branded at the factory. They are designed to feature your client's logo, not the manufacturer's. Ball covers are molded with 392 dimples from premium Dupont Surlyn material and the inner cores from high grade Thermoplastic Rubber to look, play, and feel like the top premium brands. Optional 3 ball packaging available. Delivery: 10-12 Working Days is standard. Rush Service Available.